The blog authors want to know the ranking of their blogs. Relations between page views and rankings were released by some questionnaires. However, there is no guarantee that the data of the questionnaires are correct. Furthermore, the results of each questionnaire differ mutually. Since the main point which rectifies distortion of the data as a result of a questionnaire was found as a result of considering the correct relation between page views and ranking, the compensation method was proposed. Furthermore, the relation between the correct page views and ranking using the compensation method was obtained. The actual relationship between page views and blog ranking is as follows. Three data are used for analysis as follows. Survey data of relationship between Access ranking in "Idol/Entertainment" category of FC2 blog and page views measured by "FC2 access analysis"
Data source, former "Allez! Nogizaka 46" in "FC2 blog"
Three data mentioned above are plotted on fig. 1. The page views (=the values of the X-axis) on the intersections of approximation lines and the y-axis of 100% should be zero mostly.This is because the page views of top 100% blog (=tail end blog) must be very small. 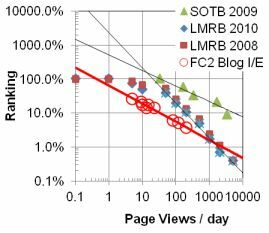 Both of data of "SOTB 2009" and "LMRB 2010" means that the lowest page views of top 100% blogs (=tail end blogs) are 20 to 50 page views a day. Therefore, data of "SOTB 2009" and "LMRB 2010" are not correct. On the other hand, "FC2 Blog I/E" means that the lowest page views of top 100% blogs (=tail end blogs) are 0.4 page views a day. Therefore, probably data of "FC2 Blog I/E" is correct. 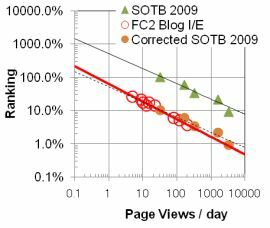 "SOTB 2009" can be corrected the relationship between page views and ranking. Since "SOTB 2009" does not only grasp the number of the blogs of a small page views, "SOTB 2009" is not correct. Therefore, "SOTB 2009" is correctable (see fig. 2). fig. 2 Corrected "SOTB 2009"
"LMRB 2010" can not be corrected the relationship between page views and ranking. The inclination of the approximation line of "LMRB 2010" differs from other two data. Therefore, it seems that "LMRB 2010" contains two or more errors. Please click here in order to jump to the page on which detailed explanation is written. The text of that page is written in Japanese. However, I wrote it in Japanese suitable for machine translation to other languages. Therefore, the text will be translated into your mother tongue if you click the translation "powered by Google" button on that page. However, since the machine translation "powered by Google" has very low capability, I do not recommend it to you. I would like to recommend you to use another translation engine. Do not use the answers whose page views are less than 30 (PV/day) because of low accuracy. Adjust ranking so that the page views of the blog of top 100% ranking (=tail end blog) may become an appropriate value (less than 1 PV/day). Verify the inclination of the approximation line in a double logarithmic chart whether it is an appropriate numerical value. (note) I wish to express great respect to efforts of two research institutes which carried out and released the questionnaire. I am very sorry if the above-mentioned sentence is impolite because of my poor English capability. Please point out if I have the mistakes in the above-mentioned text and/or data. Originally this blog "Allez! Nogizaka 46" is the blog for the fans of Nogizaka 46. So, if you are interested in the girls' idol group in Japan, I would like to recommend Nogizaka 46 strongly. Even if you are not interested in the girls' idol group, I still would like to recommend Nogizaka 46. Of course, I know that you don't know Nogizaka 46. However I would like you to know Nogizaka 46 for your happy life. Japanese people have long history about the girls' idol group. The groups of the women in the 12th century who sing and dance were recorded on "The Tale of the Heike", and were called "Shirabyoshi." The "Kabuki dance" of the girls' group which "Izumo-no-Okuni" created was in fashion in the 16th century in Japan. 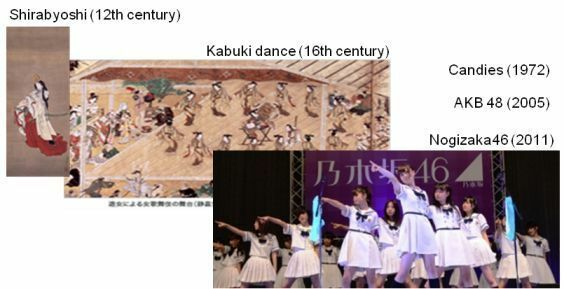 Then, since the Japanese girls' idol groups have been cultured purely for the domestic market, they are maintaining the style unique till today. Nogizaka 46 is the girls' idol group of such a style. Furthermore, the great portion of Japanese thinks that Nogizaka 46 is most beautiful girls' idol group in Japan. At least I think so. If you get interest in Nogizaka 46, please click as follows to jump to their music videos. Please click as follows to jump in order to know Nogizaka 46 .